Above: one particularly-interesting section of a recent Nielsen survey that probes console owners about the factors driving their buying habits. There's no data on just how many customers participated in this survey—could be ten people for all we know—but the listed factors are fascinating. Wii U buyers are all about that nebulous "fun factor" so often attached to Nintendo games, while PS4 owners seem to care quite a bit about what was once dubbed ResolutionGate. Meanwhile, the folks at Microsoft have built some massive Brand Power™ with Xbox Live, a service that for a very long time was synonymous with online gaming. The best part? 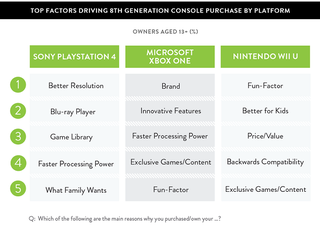 Both PS4 and Xbox One owners cite "faster processing power" as their reasons for buying each respective console. Faster than what, exactly? Each other? Just wait until those survey-takers find out about this new machine called a "personal computer."